Rise Against Hunger India’s meal packaging program is a volunteer-based initiative that coordinates the assembly-line packaging of highly nutritious dehydrated meals comprised of rice, dal (lentils), vegetables, and 23 micro-nutrients and minerals. 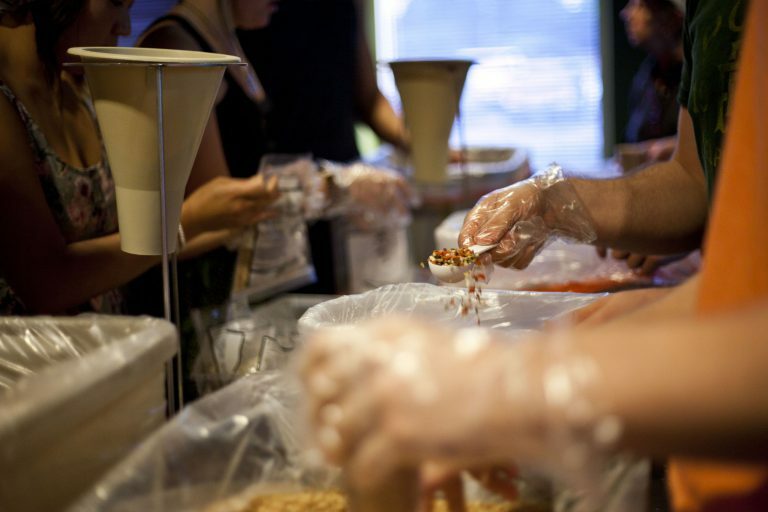 The meal packaging program was created to give dedicated individuals and organizations — from academic groups to businesses to civic clubs — the opportunity to participate in a hands-on hunger relief program and to become educated, engaged advocates for the world’s hungry. The events also give volunteers hands-on experience in leadership development, team-building, relationship-building, creative problem-solving, and goal-setting and achievement. Targeting hunger — specifically by supporting school feeding programs — leverages support to other causes including poverty, disease, education, and the welfare of women and children. In addition, meals are also provided to groups that run residential care homes for children and elderly. To get started in organizing a meal packaging event, set a goal for the number of meals you will package, and contact Rise Against Hunger India (info@riseagainsthungerindia.org). Recruit volunteers based on your goal. Then raise money for your event — only 21 Rupees for each meal you package. You can mobilize funds from your relatives, friends, colleagues – contact us if you need some help in fundraising ideas. A group of 40 to 50 volunteers can package 10,152 meals in about two hours. While the minimum is 10,152 meals, meal packaging events are easily scalable and can package up to one million meals. Rise Against Hunger India meal packaging events can be held anywhere in the country as long as the host organization has enough funding, volunteers, and locally-sourced ingredients to package at least 10,152 meals. Meal minimum may change depending on the distance from our office/warehouse location and other fees and site requirements may apply to events beyond 200 KMs from our team bases.